Probe records class load and unload events. 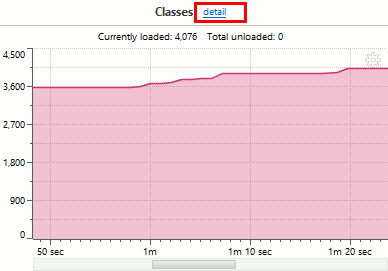 Results are available in the probes UI in tab "Class loading". There is no source code available for this probe, as it is based on low-level JVM events, available via native API only (JVMTI). This probe has no associated probe class (see above), thus a pseudo-name com.yourkit.probes.builtin.ClassLoading should be used in corresponding startup options, e.g. probe_off=com.yourkit.probes.builtin.ClassLoading disables the class loading probe.